The year is 1880, ten years after the Civil War, when school teacher Lydia Crawford leaves all she knows in Syracuse, New York and moves south. She is eager to begin a future with her fiancé Edgar Ellis in Cimarron Creek, Texas. When she arrives, she finds these southerners still resent the Northerners. Next she discovers Edgar is missing and much to Lydia’s surprise has left his pregnant wife. 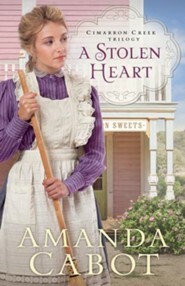 With nowhere to stay and unsure who to trust, she meets the sheriff who finds her a place to stay with his Aunt Bertha. Did Edgar leave on his own accord? Or was this foul play? Will the town people eventually grow to like this Northern Yankee? I'm the author/artist and I want to review A Stolen Heart (Cimarron Creek Trilogy Book #1) - eBook.